Each system provides energy depending on your intensity. Think of intensity as power or how much work you do over a length of time . Imagine that you had to work as hard as possible over three durations: 15 seconds , 1 minute , and 3 minutes .... The Immediate Energy system, or ATP-PC, is the system the body uses to generate immediate energy. The energy source, phosphocreatine (PC), is stored within the tissues of the body. 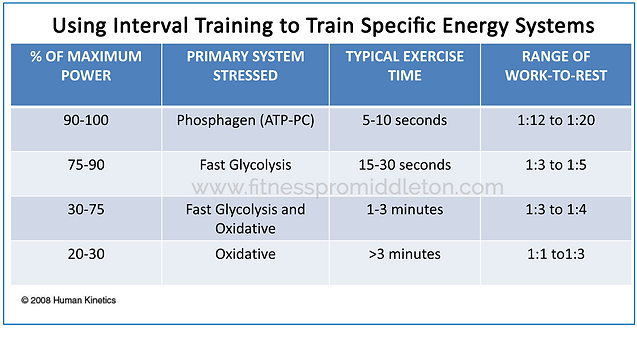 When exercise is done and energy is expended, PC is used to replenish ATP. Basically, the PC functions like a reserve to help rebuild ATP in an almost instantaneous manner. There is no “one right way” to train each energy system. Every athlete will respond differently to training depending on age, ability, past training, morphology (body type), physiology (e.g. muscle fiber type), character, mental state, motivation, skill level, and other variables. The aerobic energy system utilises fats, carbohydrate and sometimes proteins for re-synthesising ATP for energy use. The aerobic system produces far more ATP than either of the other energy systems but it produces the ATP much more slowly, therefore it cannot fuel intense exercise that demands the fast production of ATP. For your muscles-- in fact, for every cell in your body -- the source of energy that keeps everything going is called ATP. Adenosine triphosphate (ATP) is the biochemical way to store and use energy.